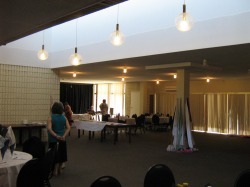 This year (2010), the Perth Messianic Assembly celebrated Passover on Saturday 3rd April at he Jewish Centre in Yokine with a Passover meal (Seder). Approximately 100 people enjoyed a wonderful time of sharing in this most ancient of Jewish feasts. Many people present enjoyed their very first Passover Seder. To experience the richness of this celebration is an amazing thing. Knowing that this is a tradition dating back some 3,500 years and that it takes us right back to the Exodus of the Jews from Egypt is a connection to history that is rarely found in a meal. Many old friendships were re-kindled that day as well as people from every age group gathered together. We followed a Haggadah that was written with Messianic believers in mind and was a truly blessed telling of the story of the Passover. For those of you who are not familiar with Hebrew words and traditions (as many present on that Saturday afternoon were not), the word Haggadah (הגדה‎) means ‘telling’ and simply describes the book that I used during the Seder that contains the words and prayers used during the meal. In the middle of the Seder we enjoyed a fantastic meal. If any of you reading this did not get to taste Jim’s Matzah-ball soup, then I can tell you that you missed one of the culinary highlights of the day. Embracing the whole concept of community, everyone brought a plate to share and nobody left the Seder hungry. We then returned to the Seder and listened while we heard the story of the Passover and were reminded how we were once slaves ourselves before we were so gloriously set free by Hashem through the death and resurrection of His only son. After that the party started! To the tuneful singing of a fantastic band of musicians we danced and sang until late afternoon. What a great way to burn off those calories we had just consumed. Our dancing ladies led us in their gorgeous golden dresses as we held hands and danced around them. Slowly, I noticed people breaking away from the dancing to chat with old friends. Even after the music ended and we were free to leave, most people stayed and talked and laughed together. Truly the essence of this day lies not just in our remembrance, but in the unity that we have as we remember and enjoy the freedom we all enjoy thanks to Yeshua HaMashiach who gave his life for us on this very day of the Passover feast. May His name be praised for evermore. p.s. don't forget to take the time to look at the photos from the day on this website (click on 'Photo Gallery' at the top of the page).